A few years back I had the opportunity of doing some martial arts training with the Guardian Angels. I was walking around New York City one day when I spotted a group of men with unique red jackets and barrettes. I knew who they were; they could be none other than the legendary Guardian Angels of New York City, those selfless men and women who patrol the city and help keep it safe. It was the summer of 2003 and I was in the USA to train at Karate College and here I get to meet some of the Angels. I went over to tell them how much I appreciate the work they do, all the 'foot soldiers' were of course volunteers. We got into a brief talk about martial arts training, krav maga,and the work they do in New York City. After telling them about my martial arts training they invited me to join them later that evening for their own street martial arts practice, how could I pass up such an offer. I joined them at their training center; a cluttered room in the Manhattan office. There were no mats, just a hard wood floor. One had to be careful about lockers on the side, a few bikes, and odds and ends. Not your typical workout area but then again, they are not training for a tournament; they are training for the street and this was the perfect environment. They seemed to share some of our Krav Maga, Reality Based, concepts. They kept it real, worked on defense against knives and sticks, grappling and striking. They also worked on the street psychology of fighting, including a lot of "acting". We acted out some typical street scenes that the "Angels" often encounter, this was very different to my world. In fact the whole group was quite different than my usual crowed, in a most positive way. People of all backgrounds and ethnicities coming together to fight crime and make New York safe; Hispanics, Afro-Americans, Jews, Asians, Caucasians. I have often found that martial arts brought together people who would otherwise never cross paths. 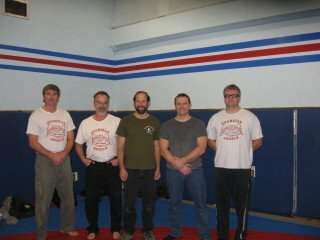 Each member went by a code name; our instructor was Sensei Crazy J, other members had names like "Hammer". They decided to call me "Papa Smurf". What an honor. One of the best aspects of the training was learning about team work; working as a team, third party intervention, correct positioning of team members. I had learned and read that most of the tragedies occurred when members went out on their own. Team work was key. We trained in concepts like "DTL" - Draw The Line, establishing boundaries and dealing with street thugs. We learned about gang warfare and mentality. It was an experience I would never forget. Members spoke about being shot and stabbed, as it were a common everyday experience. One fellow, noticing that I am Jewish, said, "I was once shot in the head and a Jewish doctor saved my life." We concluded with some ground fighting, in which I did quite well and I received the ultimate compliment, an offer to come patrol with them. I salute the fine members; the "Angels" of New York City and all their branches. When you see one of those guys in the red jackets and caps, you know you found a friend. Coming full circle I had the honor of training members of the Guardian Angels in Edmonton, Canada. I was impressed with the seriousness of the training and attitude. Once again, I find we are on the same path and share the same goals. 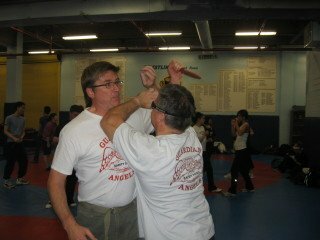 4 members of the Edmonton Guardian Angels, along with perhaps 50 or more other people, attended a Krav Maga seminar put on by Moshe D. Katz , 4th Dan Black Belt and Head Instructor with Israeli Krav International. We greatly appreciated Moshe D. Katz traveling from Israel, the opportunity to train with him, and also to speak at length with him after the seminar about this unique and very effective martial art. Moshe D. Katz is a supporter of the Guardian Angels and once patrolled and trained with them after seeing them on the streets of New York City. If you are interested in learning more about Krav Maga, we encourage you to visit his website at www.your-krav-maga-expert.com.